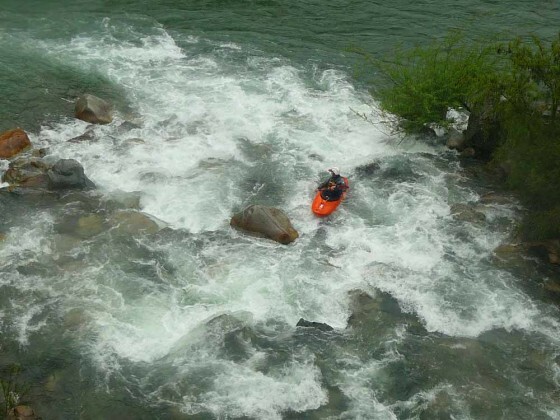 Lying on the doorstep of the lower Bío-Bío, the Río Queuco is one of the most overlooked, easy-access rivers in Chile. 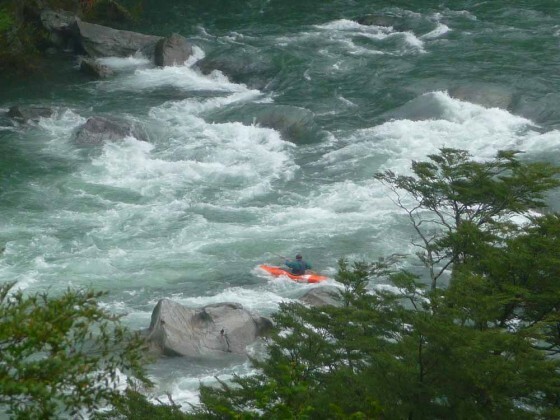 Flowing beneath the towering granitic heights of Cerro LaPepa (1853 m) and the Cordillera Tricauro, the Queuco sports a 15 to 25 km stretch of continuous, boulder-garden rapids normally runnable until mid-January. Plan on a 4-6 hour trip depending on how much you like to blindly boof or scout easy class IV. The drop just above Puente Queuco is typical of the whitewater you’ll encounter upstream. From Los Angeles, 517 km south of Santiago, drive 3 km south on the Pan American Highway and turn east towards Santa Barbara. After passing through Santa Barbara, continue another 42 km east to Ralco. Inquire in town for a shuttle driver. From “downtown” Ralco, turn east toward Paso de Pucón Mahuida, just past the Carabinero station. When the road returns to river level approximately 20 km upstream, put in at unnamed ferry crossing elevation 600 meters. Take out at Puente Queuco elevation 345 meters, just upstream from the confluence with the Bío-Bío. there is good camping on river left just upstream of the bridge. This class 3+, class 4 run averages 62 FPM and is best run in spring months Sept-Nov with flows up to 4000 CFS. December flows usually fall below 1500 CFS and January flows become low enough to look for water elsewhere.